Once you have enquired about your requirement for dental implants, your dental surgeon will assess your needs, analyse your oral health, discuss your medical history and explain the treatment options that goes in line with your requirements and lifestyle. The dentist will also explain the financing options, if necessary. Consultations by some dentists might also include digital imaging or other examinations. Most dentists or surgeons do not charge you for initial consultations. Once everything is discussed and a schedule for the procedure is decided, your doctor will examine the area of your mouth where the teeth are missing and observe the quantity and quality of bone density present. For the dental implant to remain intact, it requires adequate jawbone density for support. With a 3D CT scan, impressions of your teeth will be taken so that the ideal dental implant treatment shall be given to you. To obtain the desired result, your doctors will also suggest any additional procedures, if necessary. For instance, if you do not have adequate bone density, a procedure called bone grafting will be applied to add or create new bone. Dental examinations usually take an hour or a bit more. The design of the replacement teeth is made and the plan to place the dental implant is sorted out after the initial dental examination is done. On the day of surgery, you will be made comfortable and local or general anaesthesia will be administered before beginning the procedure. Any tooth extractions, if necessary, will be done prior to the placement of dental implants. Once any teeth are removed, dental implants will be placed in the jaw bone with surgical technique, after which the replacement teeth is placed above the implants. This procedure happens in one appointment. Some doctors might take a different approach in placing the dental implants. Once the implants are placed, they would be left undisturbed for weeks before mounting the replacement teeth. This is to give time for your surrounding teeth and soft tissue to heal. In the meantime, your bone will grow to an extent that it biologically fuses with the implant. Successively, a temporary tooth will then be placed. After the procedure is done with, an abutment will be attached to each implant. An abutment is a small connector post used to support the replacement teeth. The temporary replacement teeth and the subsequent permanent replacement teeth will then be placed to these abutments. Dental implants are loved by both dentists and patients alike, as they are highly durable and functions just like a natural teeth. Dental implants are considered a permanent solution for tooth replacement, owing to the aforementioned reasons. Once implants are placed, maintenance is important. 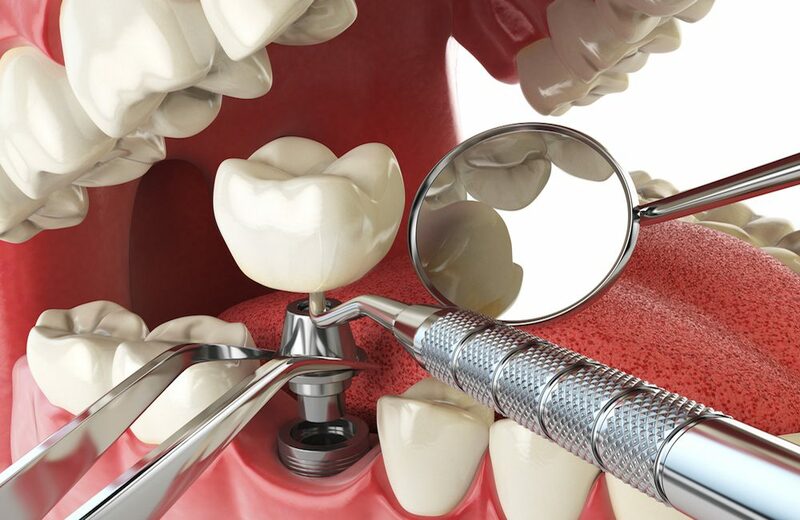 Maintaining dental implants is easy as it requires no more than regular brushing and flossing. Not to forget regular dental check-ups and cleanings for optimum oral hygiene. When you maintain your dental implants just as you would do with your natural teeth, and make regular appointments to your dentists, a perfect smile will be all yours! The all-on-4 dental implant procedure is helpful for those who are missing their natural teeth, or are wearing dentures. This is also applicable for those with weak and broken teeth. After initial consultation, those qualifying for the procedure can have just four implants and a full set of replacement teeth in just one appointment. All-on-4 procedure is also done without bone grafting and is one of the cost effective means to get a permanent smile. Missing teeth can definitely impact your personal appearance, self-esteem and confidence. Dental implants are a safe and effective way of replacing missing teeth, relative to traditional approaches such as dentures and bridges. Now that you know how dental implant procedure is done, opt for one from a dental implant specialist today and experience a brighter side of life! Happy smiling! How can I care for my dental implants at home? Brushing: Use an extra-soft toothbrush twice daily to clean pre-existing teeth or other implants, be careful to avoid the surgical incision area. If patient uses an ultrasonic or electric toothbrush, wait one to two weeks. Flossing: Use floss between teeth once in a day throughout the entire mouth except at the surgical site. Regular dental visits are recommended for long-term health and success. How long does a dental implant procedure take? The dental implant procedure is basically a three phase process, which can be different for each person. Typically the entire process takes from 5 to 8 months. Phase 1: A CT Scan is performed and the doctor will evaluate the existing dentition along with the bone structure at the dental implant site. If no grafting is needed, we can go right into Phase 2; if bone grafting is necessary, Phase 1 will take 3 to 6 months. Phase 2: The artificial root is placed in the bone and allowed to heal. The procedure itself takes 1 to 2 hours and the healing time is 3 to 6 months. Phase 3: An artificial tooth or crown is placed on the artificial root previously set into your jaw. An impression is made of your mouth and your new tooth or teeth are created so that they are the correct size, shape and color for your mouth. This phase generally takes 2 visits about two weeks apart. Dentures cannot be made into implants. Implants are metal screws placed into the jawbone to help anchor and support artificial teeth (dentures). It may be possible to have implants placed beneath existing dentures to aid in the stabilization and support for those dentures. This could only be done if the current dentures were otherwise in excellent condition. You should consult with your dentist to have your existing dentures carefully examined. The success rate of dental implants vary between 90-95 percent depending on where in the jaw the implants are placed, health and habits. Normally for a healthy person with good oral hygiene, dental implants can last for long time. With a proper care it may also last a lifetime. What will happen if you avoid dental implants in Sydney? If you delay to undergo treatment, your jawbone begins to shrink from lack of stimulation. Also losing your teeth will affect your smile and change the shape of your face, causing you to look prematurely aged. So take advice from your dentist early and do the necessary treatment to avoid the effects.